Worktops are one of the most important features of the kitchen and are often the first to be noticed. Not only do they need to be aesthetically beautiful, but they also need to be practical and hardwearing. 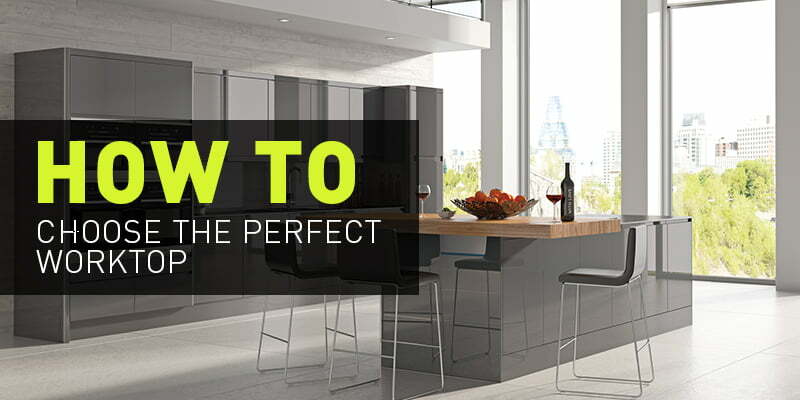 With so much choice out there, from wood to granite, laminate to marble, each with their own unique properties, it can be hard to choose which one is perfect for you. To help you decide, we’ve put together a handy guide on some of our favourite materials. Arguably the most popular choice of kitchen worktop is Laminate. Available in a variety of colours and finishes, laminate can realistically imitate many different materials such as marble, wood and copper, at a fraction of the price. Laminate worktops provide a stain resistant surface that’s easy to clean should any spillages occur. However, one of its downfalls is that it’s easily scratched, and is often unrepairable if damaged. Solid Wood is a fantastic choice for worktops, bringing warmth and texture to the kitchen. They provide a more classic look making them ideal for use in a traditional kitchen. Some of the most common varieties include oak, beech and walnut, all of which will be long standing if cared for correctly. Solid wood is naturally anti-bacterial and can be easily repaired, however, unlike Laminate, this material is easily stained, especially if spillages aren’t cleared quickly. For high quality with a unique edge, granite is the perfect option. This material is one of the most popular stones for surfaces and is available in a range of shades and patterns – each one different from the last. Their luxurious appearance is also extremely practical and is heat, water, scratch and stain resistant. However, bear in mind that granite is also a porous material, so it’s important to get the worktop sealed to protect it from any damage. For the undeniable ‘wow’ factor, it has to be marble. This delicate and luxurious material is a natural stone with different pattern variations that are perfect for creating a truly unique countertop. It’s ideal for use on a kitchen island or as a section of the worktop, introducing an exquisite feature to the kitchen. Marble is naturally a cold surface, so is very useful in cooking. However, like granite, it is highly porous and easily absorbs liquids, so be sure to take extra care as marble is unrepairable. Quartz, Corian and Dekton are beautiful modern worktop materials that are available in a wealth of colours options, from the more traditional white, black and brown to something a little different such as gold, red and blue. These materials are sure to bring character to your kitchen, along with high performance and durability. At Direct Kitchens, you can view a range of worktop samples in our Sheffield showroom, to help you decide on the perfect material and colour for your new kitchen. Our designers are always on hand to offer advice and suggest which worktop may work best for your style and practical requirements. To request a call back at a time to suit you, click here.